Perfectly balanced for precision performance for the amateur or the professional. Crafted with razor sharp stainless steel 7 1/2" blades. The hardwood handles are lightweight for quick maneuvering. 15 1/2" overall. Includes set of 2 pieces. I ordered these 6 days ago. The reason that I'm writing this review is because I've only been using these for 4 hours and on of them bent at the tip... twice. I had to hammer the tips out so that they were usable again. Definitely worth 10 dollars, but the kind of disappointed me. I have really mixed feelings about this set...my initial reaction was disapoint because these things are super light. The one decal peeled off my first time handling them and showed that the blade only goes about 2 inches into the very light wood handles. But then I remembered they only cost less than $5 a piece. They are razor sharp...literally takes the hair off my arm in one swipe. They are very interesting wall hangers or honestly feel like they would be very useful cutting down tall grass without having to go through the trouble of plugging in a trimmer as some other reviews stated. Utility over weaponry...mini sickle rather than a ninja weapon (I know ninjas repurposed farming implements but they had to be more heavy duty than this). For self defense...they are visually very intimidating but if it comes to blows you better land the first blow because they might shatter after that. In short....pretty neat. 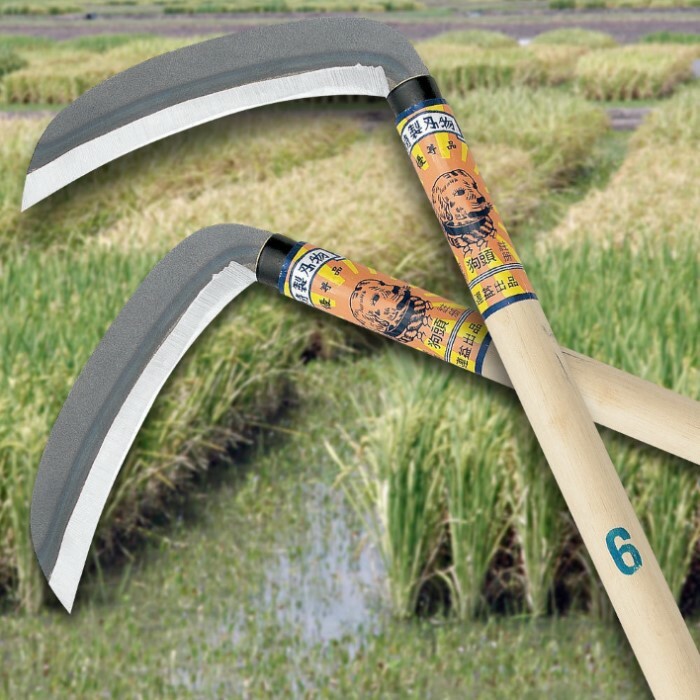 Got these for pruning tall grass in my garden. They work excellent, as these things are incredibly sharp, and surprisingly durable. They admittedly look like they wouldn't hold up well, but I've use these on a very regular basis in my garden for a year and a half and I prefer to use them over any of my other sickles or shears. The blades are well-seated in the handle, as I'm not easy on these blades, and there is not any play in them after all the times I've used them. My only complaint is not a complaint really: you have to oil the blades because they are carbon steel and will rust easily, but I don't mind this as I prefer carbon steel blades because of their superior sharpness to stainless. Great item. I don't quite understand why these are top rated. If I hadn't gotten them on sale for half price and free shipping, I would be very disappointed. The blades are nothing more than thick, stamped sheet metal that has a very sharp edge ground on them and wedged into a light weight, cut off dowel. There is also a paper sticker with tape holding it on and a mysterious #6 painted on each handle. Display would be the only use for these, but at $20, plus shipping the recommendation is definitely a NO. BudK has much, much better merchandise for that amount and less. The wood used is a somewhat soft wood for this application. the blades seem well connected though. The blades are rather thin and I am not sure what type of steel they are constructed from, but it has a good spring temper and heat treated. They are absurdly sharp. With out exaggeration, these are shaving sharp. Shaving is not a recommended use for these, but it did work well with my beard hair. 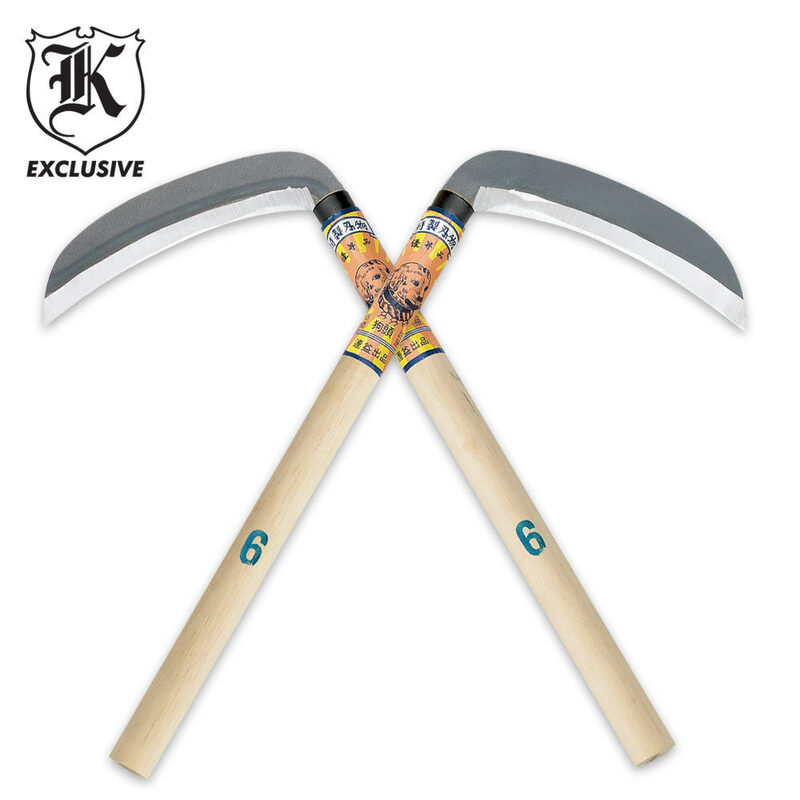 People, Kamas are traditionally farm tools used to cut wheat and canes like a scythe, if you will. Thats why it may feel flimsy or break easy. The tests they put them through are hardly mass-produced crops. Thank you. Poor quality. The wood feels as if its old and splintery and could break at any time. These felt as if they were being held together by the sticker. The blade is SHARP, but made from low quality iron. These look like they were put together by children. Although I cannot attest to the durability of these kamas, as I just received them, they are very sharp and seem well attached to the wooden handle. I wouldn't recommend heavy cutting as the blades are not thick enough for heavy duty usage but for light cutting, hacking at cardboard boxes, or for display purposes these work very well.